Back in April last year, Google rolled out a major UI change to Gmail for the web which brought up-to-date "Material Theme” to it. Today, after months later, Google is rolling out the same UI for the Gmail for Android app. The user interface change is rolling out beginning today. This is a standard update, though, so it may take some time before it arrives on supported devices out there in the wild. The customized font is the primary change here, with Google adopting its own Google Sans font. Being able to switch accounts has been moved, too, and can now be found in the top-right corner, embedded within the search bar. 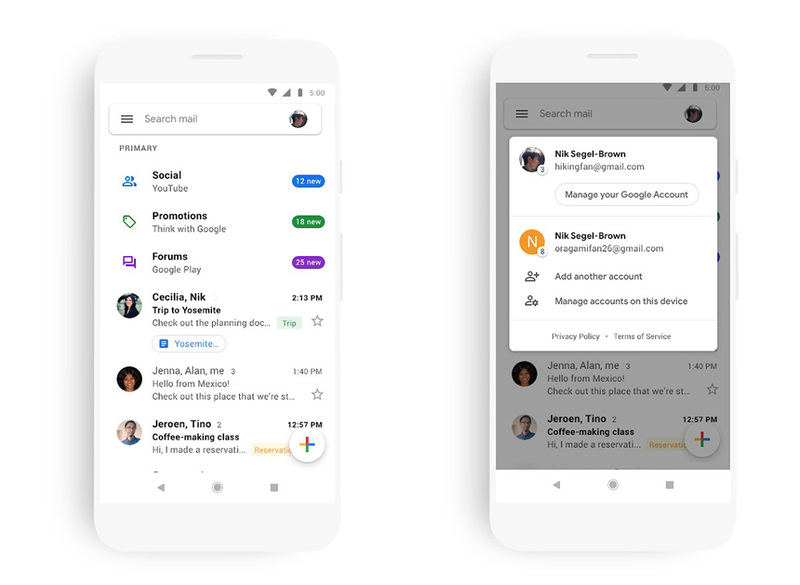 The search bar is the go-to option now, serving as the primary means of navigation when it comes to finding emails and more. Users can choose different stylings for displaying their emails, just like on the web. That includes compact, default, and comfortable. Otherwise, there aren’t many new features being added to the mix. The update is meant to show off the Material Theme more than anything else. Which should be a welcomed addition for folks who like the design aesthetic.